I have always had a thoroughly romantic view of sewing. If my mum would ever mention how she had handmade my older siblings clothes I felt utterly hard-done by, lamenting my off-the-peg garments – even the hand-me-downs had a label. And so when I recently decided to actively pursue some hobbies, top of my list was, of course, dressmaking. The pattern arrived yellow-tinged and musky smelling – I was thrilled with the assurance that the instructions had been pre-loved by someone now 50 years older than when they first created their ‘modern’ frock. I wondered if they still had it or even remembered making it. Although the pattern evoked great excitement and ambition in me, it was a number of months before I actually took up a dressmaking class. I had been waitlisted for the course and when I finally received the call I was so eager to begin that I took no notice of the gentleman caller’s advice on materials, fabrics and most importantly pattern types. I took myself off to Hickeys with a spring in my step and the persona of dressmaker extraordinaire. I purchased scissors, chalks, measuring tapes, pins, buttons (all good seamstresses have lots of unnecessary buttons), cushions, needles, thread, remnants … I had arrived! Then on to choosing the fabric … a beautiful white and pale blue floral material caught my eye and it was instant love. Straight to the counter… only they didn’t have enough fabric for a skirt that size and my charming, perfect material was an end of line product. Not one to over-react I felt my previously perked chin begin to tremble. ‘Hang on now love – they might just have some left in Galway’ reassured the unconvinced assistant. Low and behold they had it! And didn’t this just make it all the more exciting? I’d receive a package of material … in the post … probably wrapped in brown paper and string … I was Laura Ingalls for goodness sake. On my first day of class I met the teacher Michelle, an elegant lady that I imagined to have a house full of mannequins and works-in-progress. She spent time with every student at the start of class, examining their choice of fabric and talking them through cutting their pattern: their basic beginners skirt pattern that is, as recommended by the gentleman caller that had been drowned out by my over-active imagination. When she approached, a mild panic overcame me as I envisaged being scolded for my lack of concentration before the course had even begun. Happily there was no such lecture. Michelle told me that the fabric brought a smile to her face and she looked forward to tackling the pattern with me – of course it needed a lot of work as the sizing was over 50 years old and also originally from America so the sizing differed greatly – how long exactly had I been making such dresses?? It didn’t take long to establish that I had jumped in headfirst with not a thought for the execution of my new project. Thankfully all involved seemed to find this endearing and I was given generous attention and guidance. This began with the working out of sizes on calculators and sticking the resized pattern together with masking tape – not what had been offered on the course description. The encouragement ensured that I enjoyed every minute of my classes and sewed (and more often unpicked) with gusto. Unsightly pin-pricked fingers and puckered hems were obliviously overlooked. And oh, the thrill when my dress bodice first took shape. And when I added my first zip? Joy beyond compare! It took a couple of full classes for me to even cut out the skirt but once it was fully pinned it dawned on me that I was really going to complete the dress. Michelle told me that it reminded her of Paris in the springtime and I was prouder than a child with a finger painting. By the time it came to adding the tulle the class would gather around with much ooooohhhing and aaaaahing. My project had become Michelle’s project and I was delighted that someone was as invested in it as I was. The classes came to an end after 10 weeks and I was left to finish the bias binding myself and instructed strictly to hand-sew the lining with care. I assured Michelle earnestly that I would. The dress was immediately hung in my room where it remained until a few days before the Galway Races to which I was planning to wear it. Emergency! I needed to finish it urgently. There was only one thing for it … to Mama’s house. Of course my mother lovingly finished all of the parts that I should have done myself and not only did she not tell me off or suggest I was cheating but she took on the role of proud co-creator. She gave me notice of a collection time and when I got there not only was the dress hemmed but there was a pair of beautiful short white vintage gloves and a headpiece of straw and lace that she generously made for me herself. There was great trying on of pieces, suggestions of angles and fittings of brooches. I couldn’t believe that my pattern had become a dress and now my dress had become an ‘outfit’! A few days later we hit the west of Ireland where I donned all of my garments, applied a matt red lipstick and felt that I was playing dress up. It occurred to me that I now really knew what it meant to have a labour of love. There can be no greater feeling than achieving a goal you have set yourself (yes of course by this time I had blocked out all the help I had received). 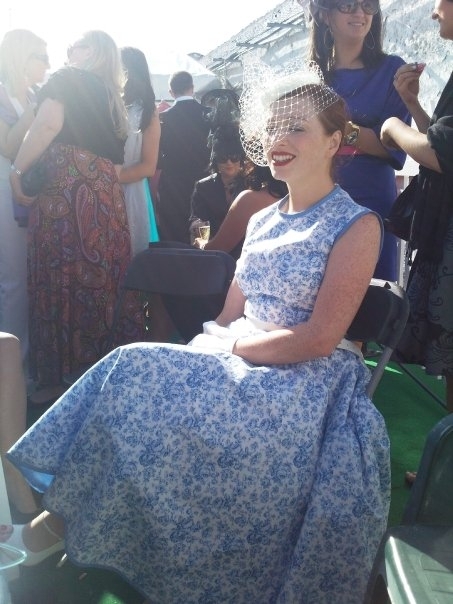 As I excitedly supped on bubbly with the girls and we soaked up the stylish atmosphere in the racecourse I began to wonder … had anyone worn a similar dress to the Kentucky Derby 50 years previous?